Memorial Card for the funeral of Mrs. E. V. Shipley, who died January 27, 1892. I found an Anne (Spencer) Shipley, who was born November 20, 1837, the daughter of Asa and Phoebe (Piggott) Spencer of Guernsey County, Ohio. 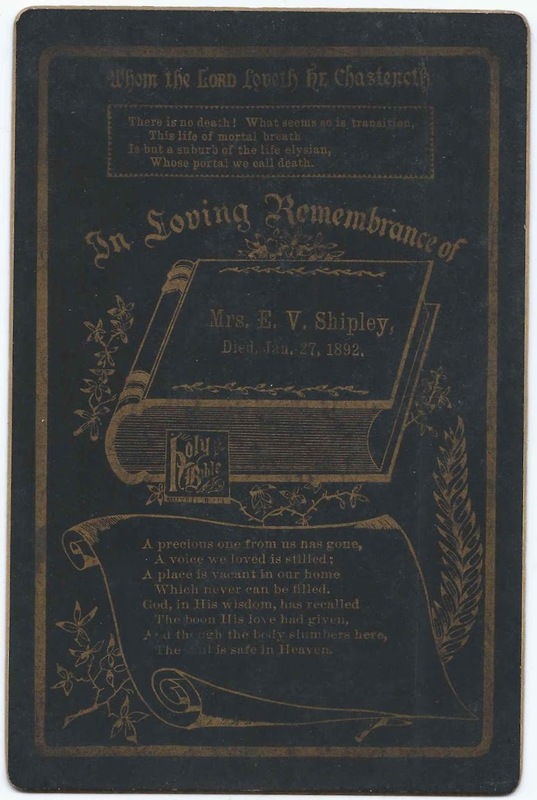 On February 9, 1860, Ann married Emory Vinton Shipley, son of Perry Lloyd Shipley and Adeline Frances (Delauter) Shipley. Emory was a postmaster; the couple had six children. By 1880, the couple were living at Barnesville, Ohio; they're buried there at the Southern Cemetery.